Now that we've got show coverage all but wrapped up for the 2008 Geneva Motor Show, we're thinking it's time to show you a bit of Geneva itself. The Swiss are famous for roughly two things: their unwavering neutrality and chocolate. 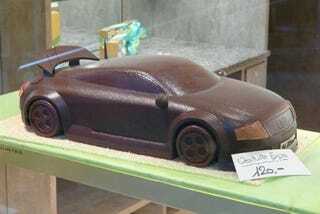 What better cause célèbre for creating a chocolate car than the auto show? We found this stylized Audi TT and it's lesser automotive friends on display at a Chocolatier near the train station. Rumor has it the car is equipped with the exclusive new aero package and a candy coated dual clutch DSG system. BTW, the Swiss Franc trades roughly on par with the US dollar, so that's about a $120 confection. Yowch.